At noon today, my dad was back in Spokane, free to enjoy the afternoon a whole country away from where he was earlier this morning. After spending the weekend with his son, daughter-in-law, and (last, but definitely not least) granddaughter, I drove him to the airport at 4 a.m. this morning to fly back home. The time zone adjustment might make him feel a bit disoriented, but nothing will cloud the memories he made this weekend. 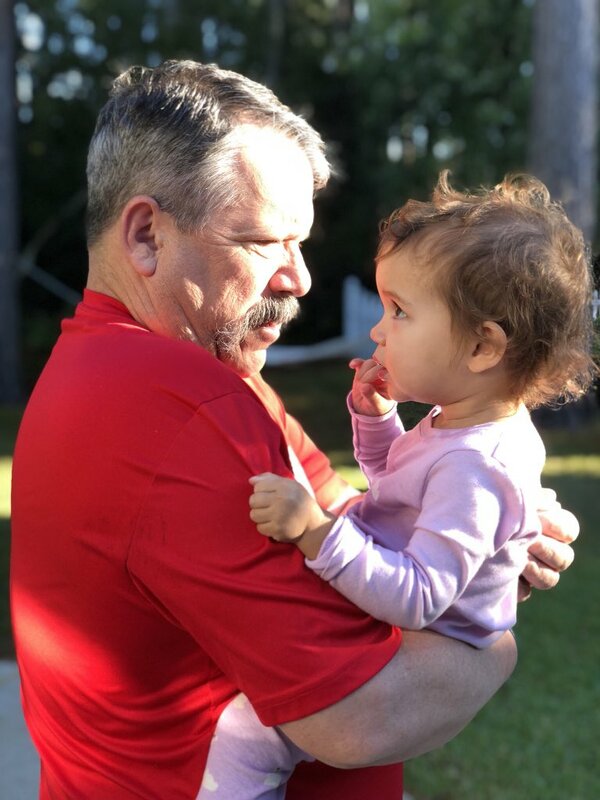 For my recap of my dad’s late October trip to Myrtle Beach, I wanted to list and briefly (I mean it this time) describe 10 highlights from his visit. My dad and Sloan shared many special moments together this past weekend. Picking Up Sloan From Daycare – On Thursday afternoon, over 100 days had passed since my dad last saw Sloan. When we showed up at Oxford Children’s Academy, he immediately picked her out of the crowd when we went out to the playground. It was the beginning of some serious bonding. Thanks to the OCA staff for being so kind and welcoming to my dad! Trunk or Treat at Geoff’s Church – On Friday night, the four of us attended the Myrtle Beach Jesus Christ of Latter-day Saints’ trunk or treat event. My dad got to see Sloan dressed up in her unicorn costume for the first time and he smiled as he watched her enter the various classrooms of the church to trick-or-treat. After the candy grab, we went inside the church’s gym to watch my co-worker and friend, Geoff Insch, perform a concert with his band, Mr. Inch and the Millimeters. Throughtout the performance, Sloan tore up the dance floor. The three of us outside the Myrtle Beach Jesus Christ of Latter Day Saints church before we went inside for the trunk-or-treat. 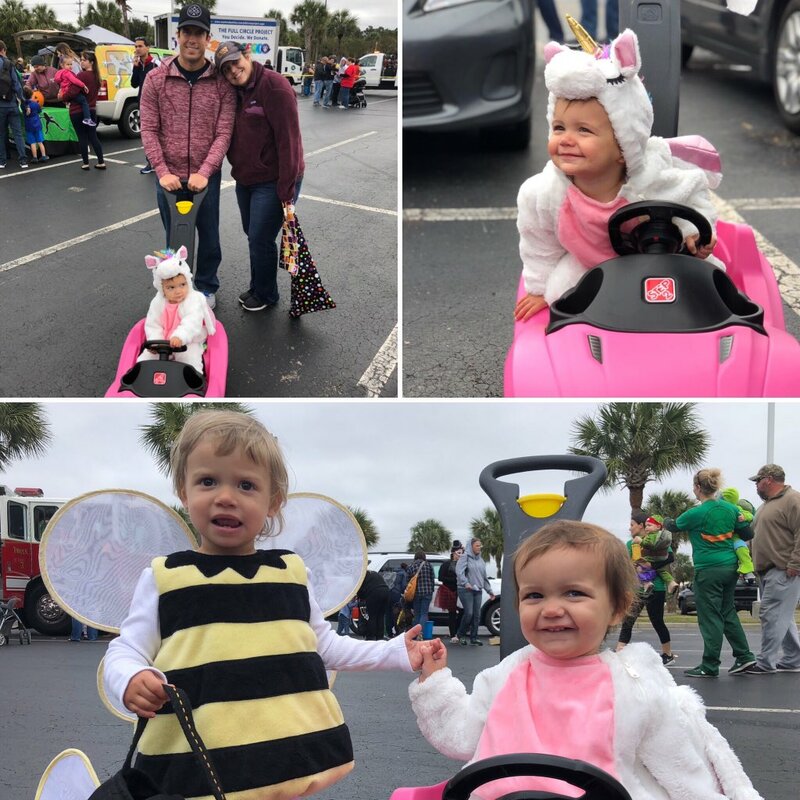 Trunk or Treat at Broadway at the Beach – After we returned home on Friday night, Sloan didn’t take her unicorn costume off for long. The next morning we were off to Broadway at the Beach, a major Myrtle Beach entertainment complex, for another trunk or treat event. Although it was chilly, Sloan was in good spirits as she spun around the parking lot in her pink car. Best part was introducing my dad to several of our friends who also happened to be at the community gathering. 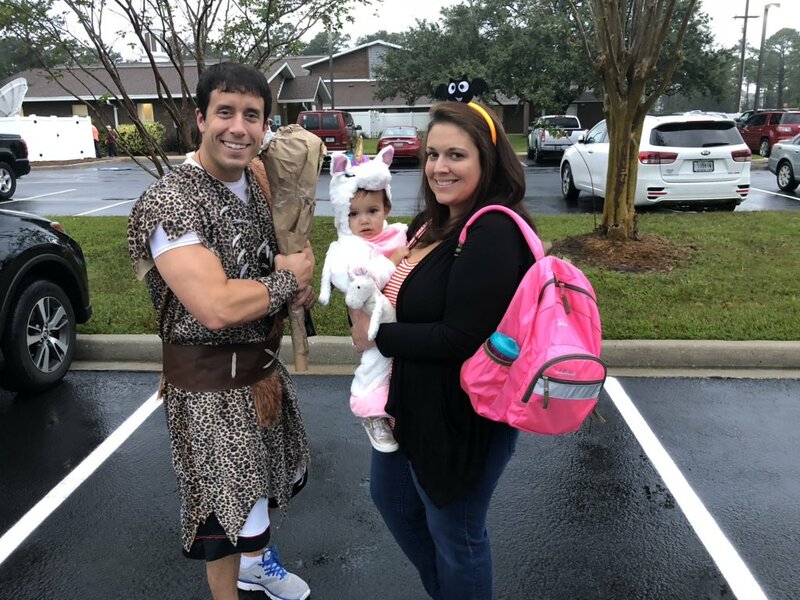 The Broadway at the Beach trunk or treat was another opportunity for papa to have Halloween fun with Sloan. Sloan Carves a Pumpkin, Part II – Last October, my dad carved a pumpkin with Sloan. It was so much fun that we did it again this year. 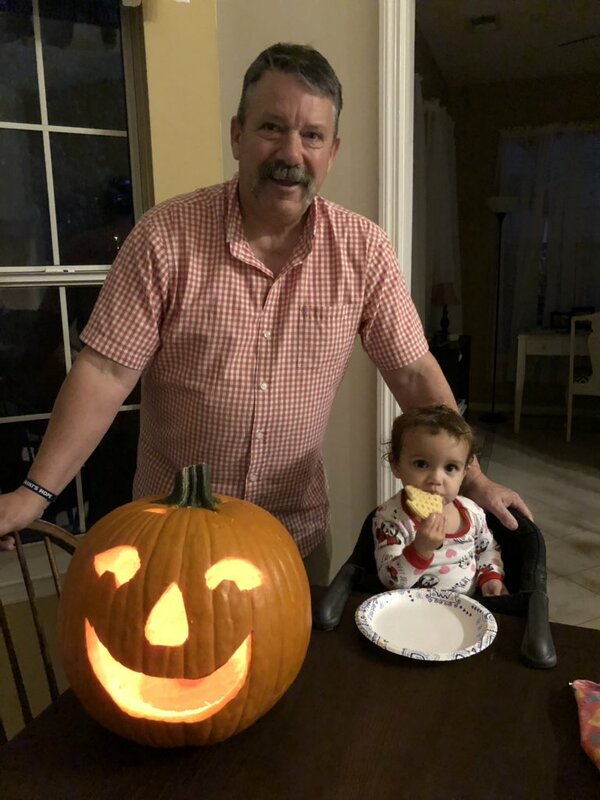 After finding the perfect pumpkin at Publix, papa and Sloan carved it last night. As spooky music played in the background, the duo worked hard to create a jack-o’-lantern that resembled a certain 19-month-old. It was a success! They say that after you do something twice it is a tradition, so it looks like my dad is booked for next October (and the next, and the next, etc.) as well. Sloan and Papa carved a very nice-looking pumpkin. 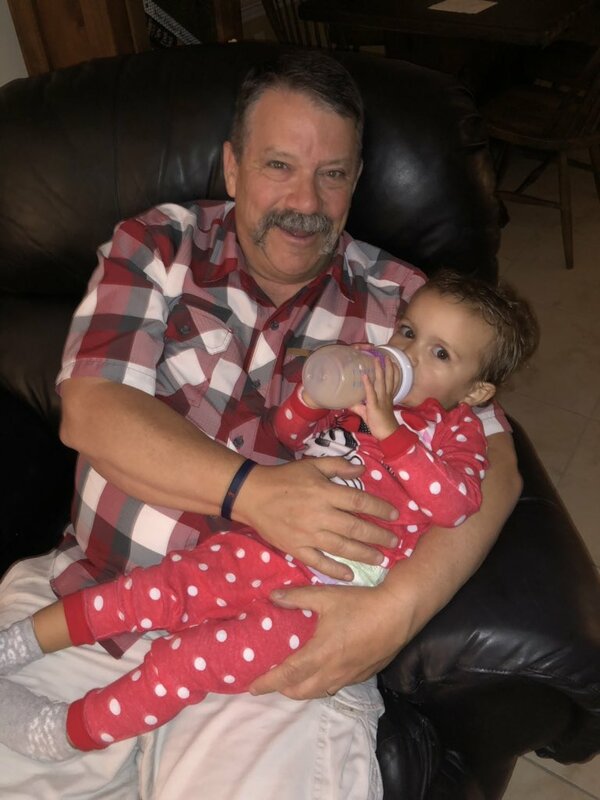 In the Middle of the Night – The first night my dad was in town, he didn’t wait for us to comfort Sloan when she cried out in the middle of the night. He went directly into her room (our guest room is right across from Sloan’s room) and changed her and fed her. He enjoyed his special time with Sloan in the wee hours of the morning, even if he had just traveled across the country on an exhausting flight. The next evening my dad would bring Sloan into bed with him for an hour after she once again woke up seeking some TLC. My dad would get up with Sloan in the middle of the night. 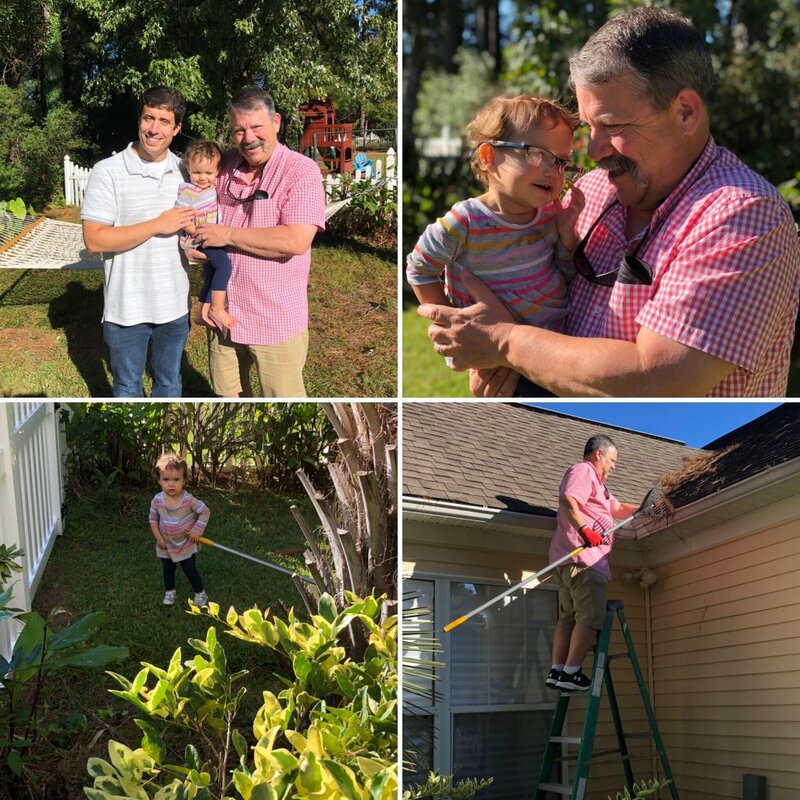 Playing in the Backyard –Although the weather didn’t always cooperate this weekend, my dad and Sloan soaked up every moment that it did. The duo spent plenty of time in our relatively large backyard as they ran around, explored the hammock, and even did some work with the gutter. For a girl who is always saying “outside, outside” she sure appreciated her papa playing with her in the grass. These two sure played hard in our backyard. 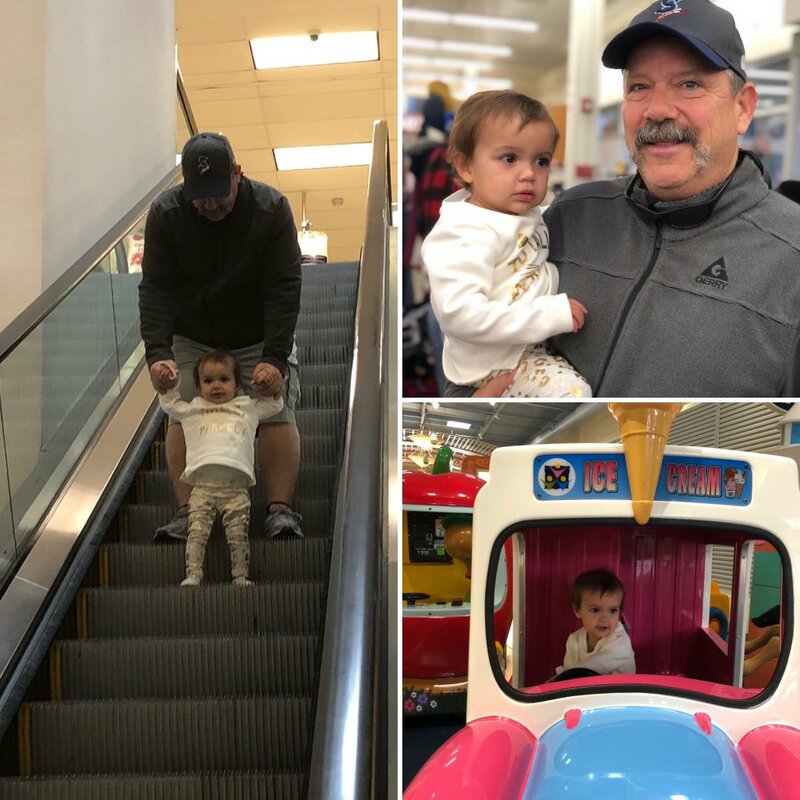 Fun at the Mall – After the Broadway trunk or treat event, we all went to the mall. While Sidney and I looked at clothes for Sloan, my dad let us browse in peace as he took her out in the mall area to play. He let her ride the coin-operated rides, chase bouncy balls, and go up and down the escalator. Next time we return to Coastal Grand Mall, she is going to have very high expectations. My dad and Sloan ran wild at Coastal Grand Mall. Sunday Lunch – We had such a nice time early in the afternoon yesterday. Sid’s parents and her sister came over to have lunch with us. I always enjoy it when my family is able to get together with Sidney’s family and Sunday was another perfect example of why it is so enjoyable. Members from the Reser and Mathis families were under one roof to celebrate and enjoy a certain person who is so special to them both – Sloan. She definitely put on a show as we ate grilled hamburgers and hot dogs on a sunny and warm day. 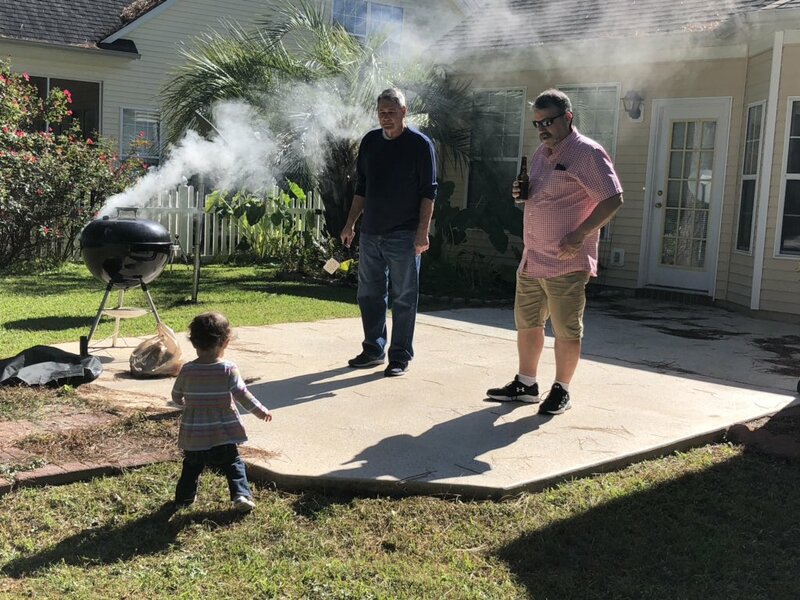 Sloan watches her two grandpas as the hamburgers and hot dogs cook on the grill. This is one of my favorite photos I have taken in a long time. Lunch in the Cafeteria – I worked a half day on Friday. My dad came and picked me up at the office at noon. Before we went to pick up Sloan at daycare, we went to Palmetto Bays School to pay Sid a visit. We brought Bojangles with us and ate lunch with Sid, her students, and her fellow teachers. 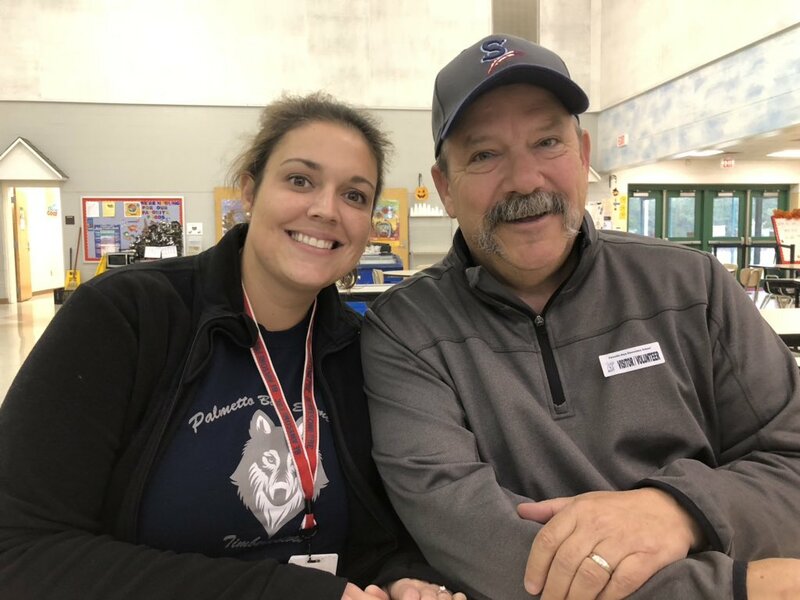 Not only did my dad get to meet Mrs. Reser’s 2nd graders but I got to meet them for the first time as well. Sid and my dad at Palmetto Bays on Friday. We visited to eat lunch with Mrs. Reser and her class. Nightly Sports – When night fell and both my girls went to sleep, my dad and I stayed up and watched sports. Whether it be the World Series, college football, or the NFL, we hung out in the living room and watched the action. These days I don’t get to watch sports on television that much so to have the opportunity to do so with my dad, something we always used to do, was something I tried not to take for granted. It was the perfect way to end each day. Night Out for Adults – These days, it is almost impossible to take Sloan out to a restaurant – she is just at that age. However, we still wanted to go out to eat at least once while my dad was here. On Saturday night, my in-laws graciously watched Sloan for a few hours so we could attend mass and then dine out. We opted for a place we never tried before, Lombardo’s, an Italian restaurant on Kings Highway. The food and atmosphere both impressed as we had a relaxing (and very quiet) evening. We ate dinner at an Italian restaurant called Lombardos on Kings Highway in Myrtle Beach. I am so thankful that my dad traveled so far to see us. He treated us so well and I can only hope that we did enough to reciprocate. Sloan can’t wait to see her papa again in December! Don’t Blink. 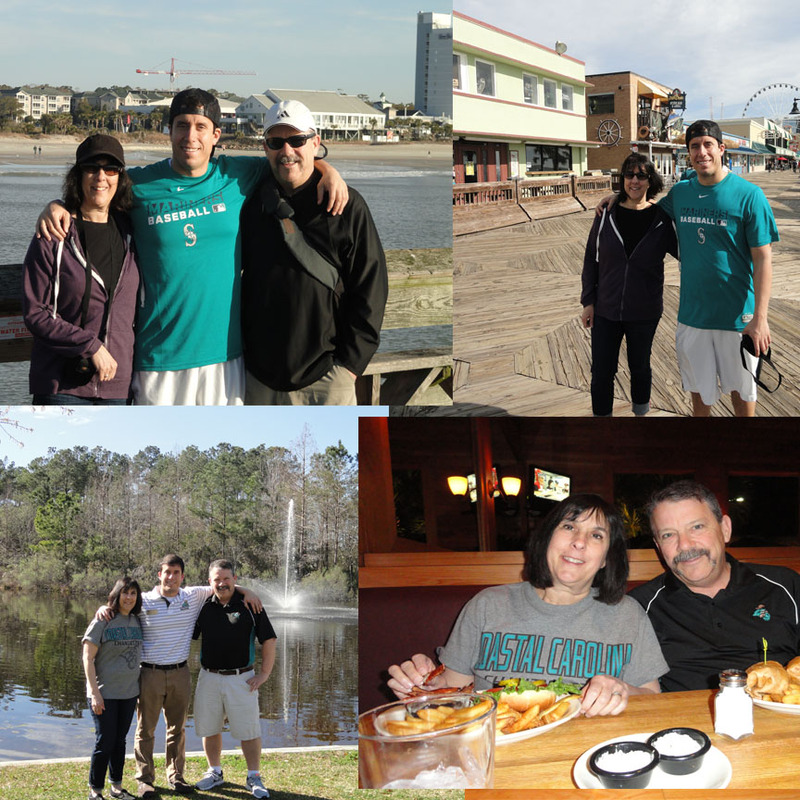 At the end of last week and through the weekend, my parents visited our little family here in Myrtle Beach. It was great to see them and catch up. Most of all, it was special to watch them bond with Sloan. My parents arrived on Wednesday and left on Monday. I thought the best way to organize this trip recap would be to describe my favorite moment from each day they spent here. If that is okay with you, I will begin. 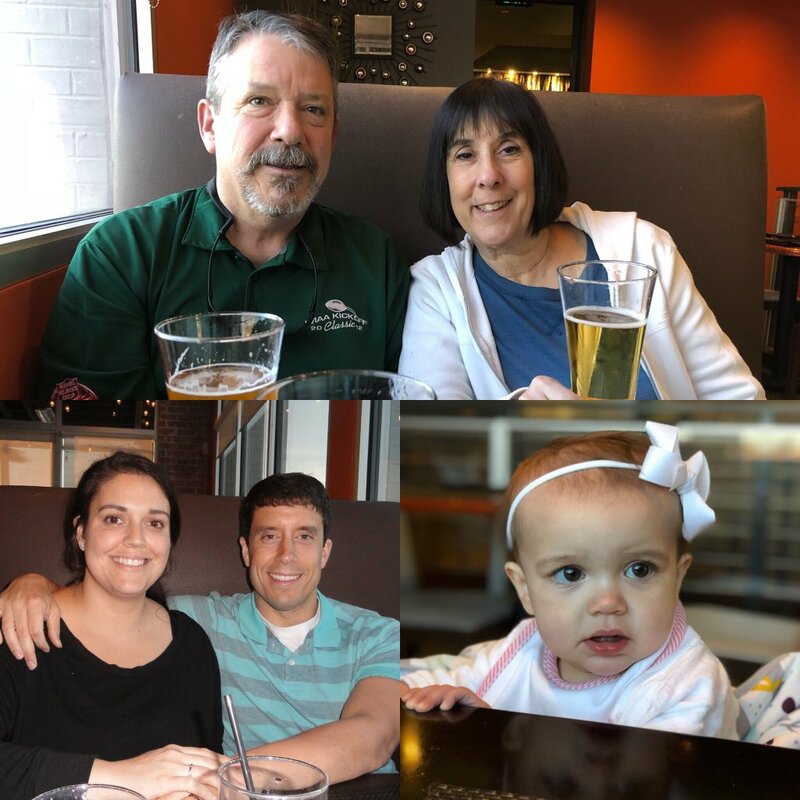 Wednesday, April 4: The highlight of this initial day was just watching the joy of my parents as they reconnected with Sloan after 100 days apart. We thought Sloan would be a little apprehensive toward my mom and dad since it had been so long, but she picked right back up at the same comfort level from where she left off. 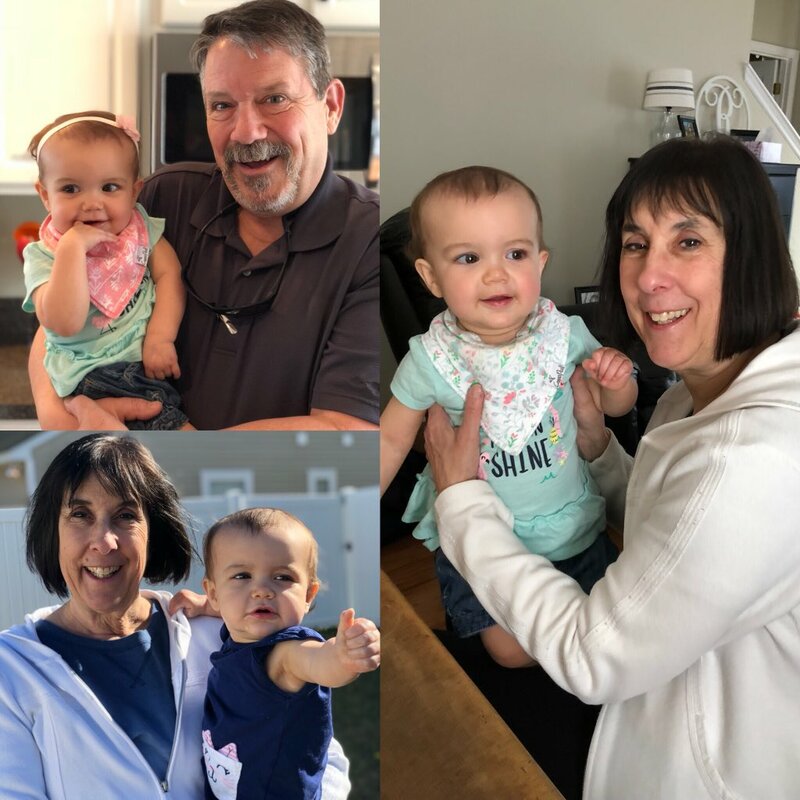 My mom was able to give her granddaughter all the kisses she had saved up over the last several months and you could just tell that both of my parents were at total peace in Sloan’s presence. My parents were so overjoyed to see Sloan again that first day. Thursday, April 5: The aspect of this day that really stands out to me is the dinner the five of us shared. We went to Rivertown Bistro, a creative and tasty restaurant in downtown Conway that is beloved by the entire Grand Strand community. If you want to treat yourself, it is the place to go. We were given upstairs seating where we sat at a booth that overlooked scenic 3rd Avenue. The food was incredible and Sloan was on her best behavior as she sat at the head of the table in her cute outfit and bow. It was a relaxing and memorable experience. We had such a lovely dinner at Rivertown Bistro in Conway. Friday, April 6: For obvious reasons, my parents weren’t able to attend Sloan’s birthday party on March 17. However, we made up for it. After I got off work on Friday afternoon, the five of us gathered around the table for an encore celebration of Sloan’s birthday. We had an extra smash cake stored away that we brought out. 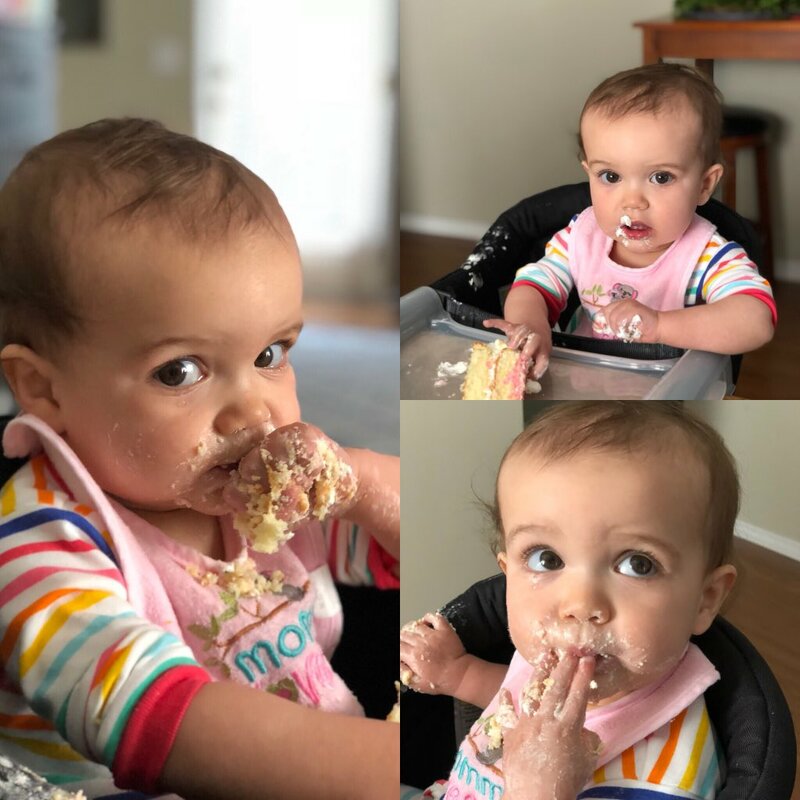 I cued up the slideshow I created for her birthday party and Sidney stuck a candle in the cake and we sang “Happy Birthday.” It was an intimate celebration that made my parents feel included in her birthday festivities and that allowed Sloan to stuff her face with more cake! Sloan enjoying her second birthday celebration, this time with grandma and papa. Saturday, April 7: My mom and dad kept talking about how much they enjoyed this morning so it was a no-brainer to include it as the Saturday highlight. We went to the Paula Deen Family Kitchen for breakfast, a restaurant that serves meals family style. 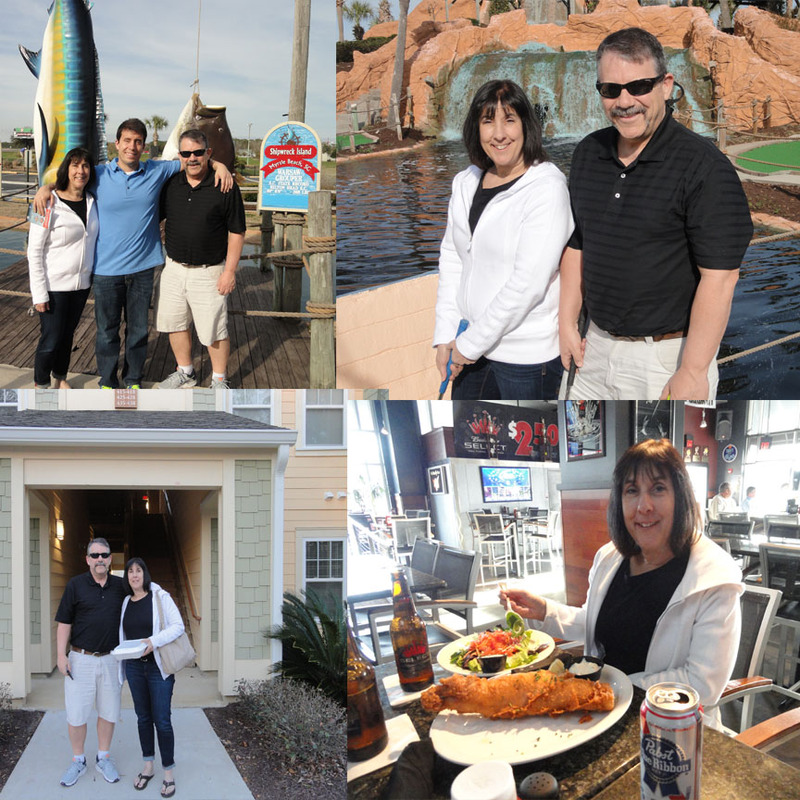 We all ate way too much but we then walked it off by exploring Broadway at the Beach, an outdoor entertainment area in the heart of Myrtle Beach. With the weather absolutely perfect, we strolled around the premises while my parents shopped for souvenirs. Sloan enjoyed the favorable conditions as we all took turns pushing her in the stroller. It was a very pleasant way to spend the first half of the day. 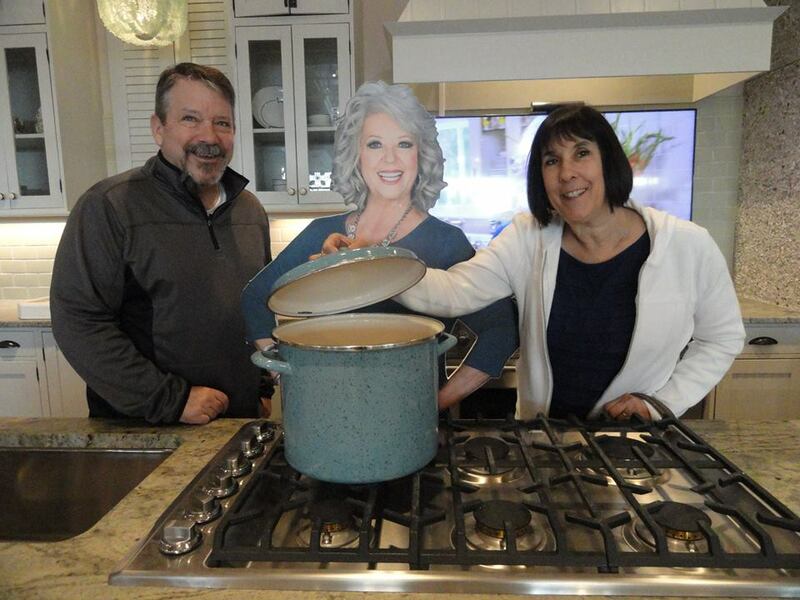 My parents having some fun at the Paula Deen restaurant at Broadway at the Beach. Sunday, April 8: The dinner we had this evening was just as memorable and delicious as the dinner we had on Thursday. 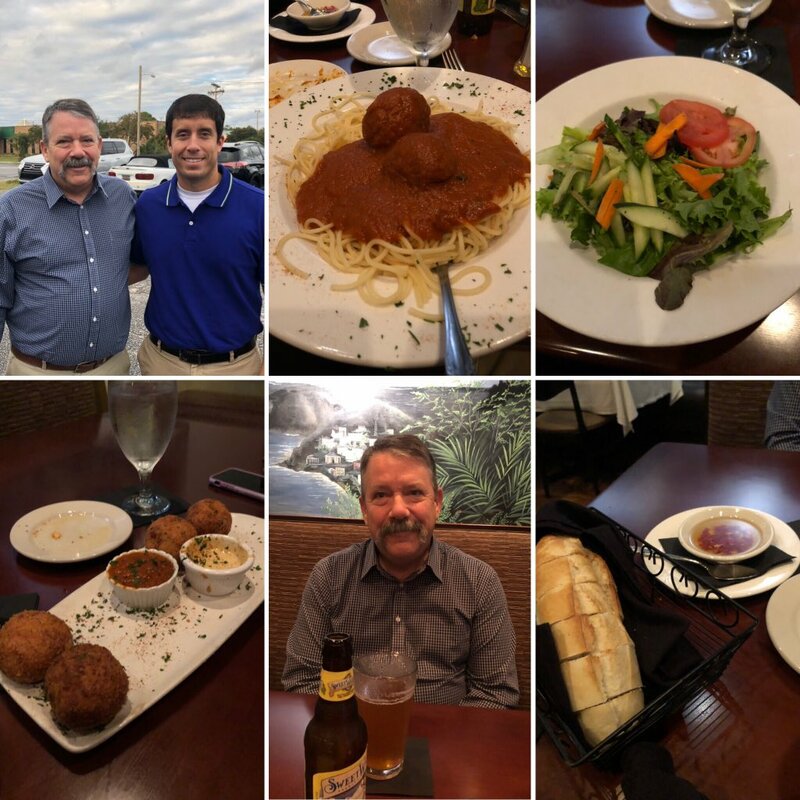 We met Sidney’s parents at Greg Norman’s Australian Grille for some good food and better conversation. It was important to Sid and I that we got both sets of Sloan’s grandparents together. The fact was not lost on anyone that during those moments, the six people who love Sloan the most were all seated around her at the same table. 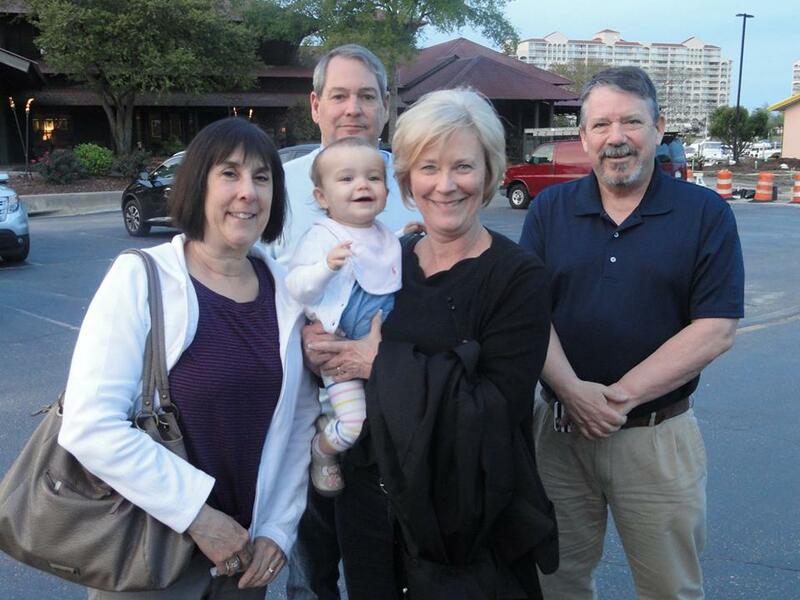 Both sets of Sloan’s grandparents outside of Greg Norman’s Australian Grill on April 8. Monday, April 9: My parents said goodbye to Sloan in the morning, right before I took her to daycare. However, since their flight didn’t leave until 2:30 p.m., I was able to take my lunch break to meet up with them one final time. We convenrd at Chick-fil-A for a quick lunch. As we ate, we talked about how much we enjoyed our time together and how much we appreciated each other. We recapped our trip and my parents never missed an opportunity to tell me how lucky I am to have two wonderful girls in my life. It was the perfect way to cap off the trip. 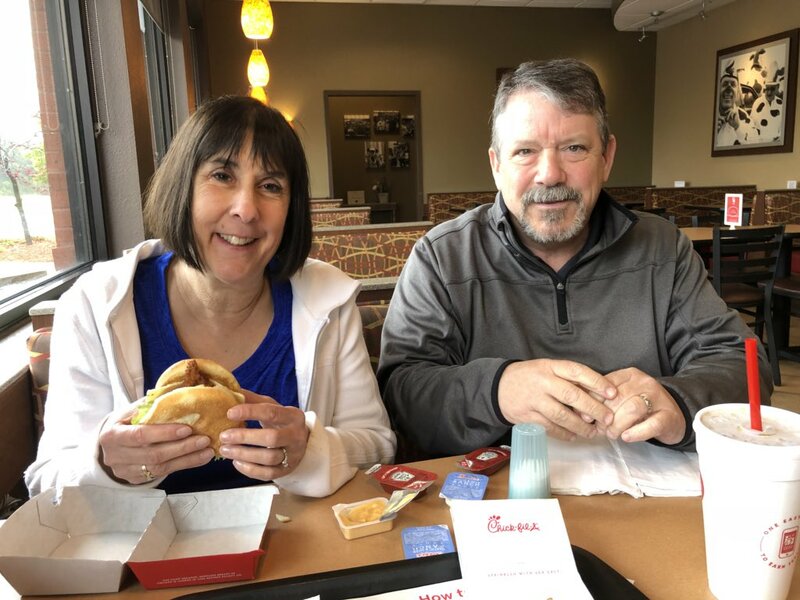 My parents at Chick-Fil-A on April 9. Great way to conclude the trip. My parents keep thanking us for letting them come stay at our house but they have it all wrong. Sidney, Sloan and I want to be the ones to say THANK YOU. We were spoiled and catered to the entire duration of their stay. Mom and dad, we already miss you. Sloan can’t wait to see you this summer. Don’t Blink. This past weekend, I finally experienced something I had only heard about. After all the legendary stories from friends, after all the commercials, and after all the complaints from the people in whatever city I lived in about the lack of a location, the wait recently ended. On Saturday night, the place that once seemed only mythical to me was revealed. I finally went to a Dave & Buster’s. Well, to be honest, I actually got my first taste on Friday evening. 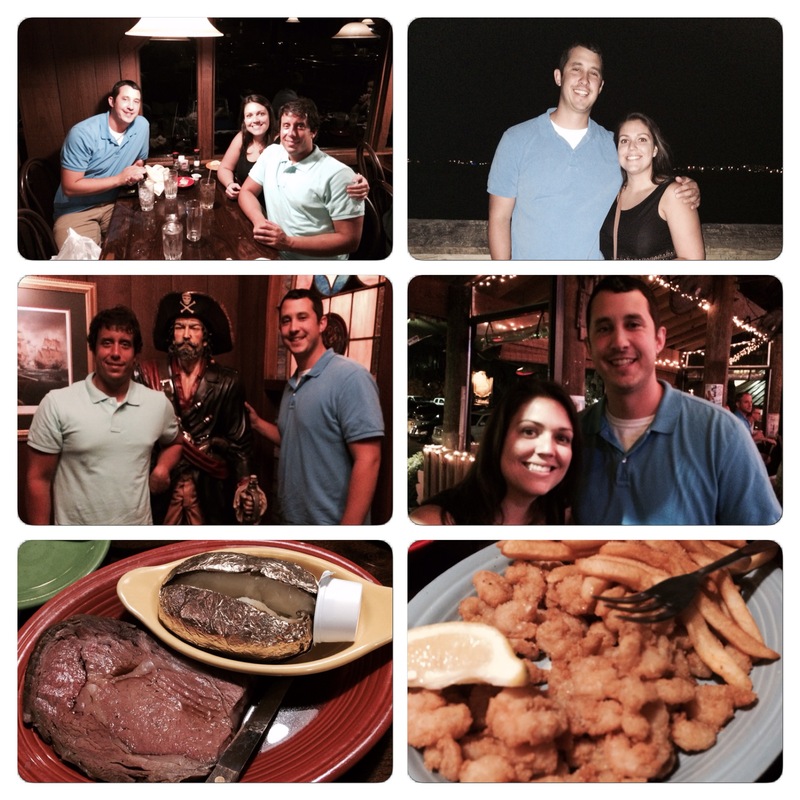 My mom, brother, and I went to one of Myrtle Beach’s hottest spots, Broadway at the Beach. It is at this major destination for tourists and locals alike that the new Dave & Buster’s recently opened. At around 10:30 p.m., we walked through the place. Talk about a sensory overload! We needed time to prepare for this one. The next day, my brother and I made plans to return to Dave & Buster’s with the intention to actually “play” this time. We swapped my mom out with my wife. Exactly 24 hours from our initial brief visit, we walked through the doors again. 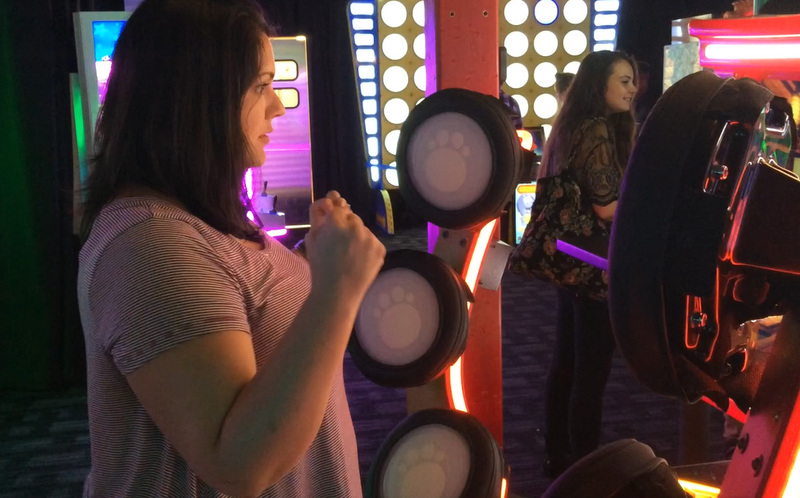 Although I didn’t really play too many games while we were at Dave & Buster’s, I made sure to race against my wife. It was the exact same circus it was an evening earlier. The facility, which contains a large bar, game floor, restaurant, prize center, and TV area, was filled to the brim with people. On both visits the demographic was primarily in the 18-30 range, with many of the people dressed fashinonably. A sense of excitement that you could feel buzzed around the entire place. Folks were running in every direction and you had to speak up to be audible. It was pretty insane. What first jumped out to me was how pristine the place was. It was spotless and, for good reason, everything was visibly brand new. The bar area was extrememly inviting and trendy. The televisions were all top of the line big screens. The game floor was covered with the latest and greatest gaming technology on the planet. Well-trained employees did their jobs with purpose. 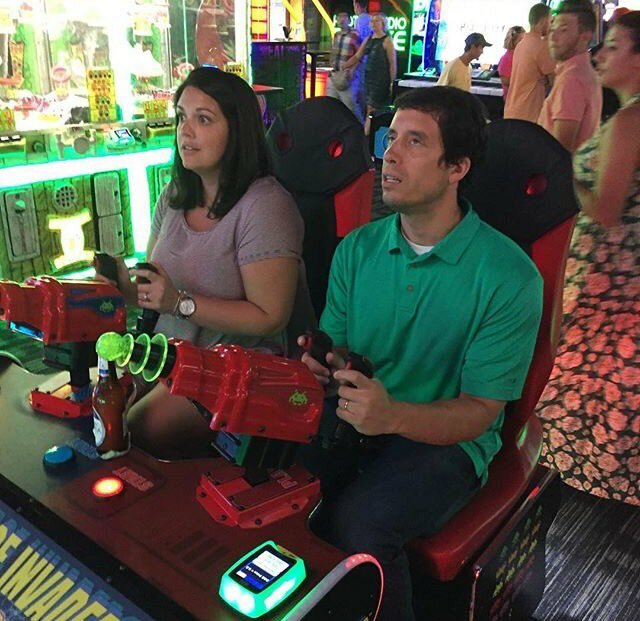 There was absolutely no debating that the Myrtle Beach Dave & Buster’s is impressive. Although it would have been nice to sit down, order off the menu, and sip the signature cocktails, we came to play the games and drink beer. Well, that’s what my brother and wife did at least. I primarily just did the latter as I was a little intimidated by the high volume of people seemingly taking up every game in the place. Sidney and Glen both loaded cards with “chips” and got right to it. Throughout the hour or so we were there, they played classics like basketball hot shot and football toss. However, they also played many of the “high risk, high reward” type games where you try to earn tickets by utilizing “skill” to drop an object into a cup, knock coins off a ledge, stop a light strobe on the jackpot, etc. Sidney also played Guitar Hero and Kung Fu Panda. Sidney playing Kung Fu Panda at the Myrtle Beach Dave & Buster’s. The value of it all? Heck if I know. Consider this: You pay for all games with a Dave & Buster’s card. Loaded onto that card are chips, the “currency” system of D&B. Topping the confusion off, each game seems to require a random amount of chips to play. Thus, deciphering the amount you are paying per each game gets lost in translation. I had absolutely no idea if the game my brother or wife started playing happened to be $1, $2, or $5 per single play. I do know this: Glen and Sidney each loaded their cards with $25 each and while it didn’t last forever, it also wasn’t gone in the blink of an eye. The atmosphere of Dave & Buster’s is what appeals to me. In a way, it is much like a casino. I enjoy going to a Vegas style casino every now and then to just soak in the excitement, have a drink, and people watch. I don’t really gamble that much. With Dave & Buster’s, I don’t really “game” that much but I do appreciate the vibe. Even though we have Dave & Buster’s within 10 minuites of our house, I definitely won’t be going every weekend. However, it is a place I can see myself going to every now and then. Saturday night provided us with a fun evening and a great orientation to one of our country’s most talked about adult entertainment centers. Don’t Blink. Four years ago, I ripped off a standard content hog of every newspaper you will find in this country. Do you know what I am talking about? Every publication has a “Best of (insert city here)” where readers are polled and asked to vote on their top choice of restaurant, bar, news personality, realtor, ice cream shop, etc. etc. Well, in 2012 I used this blog and published my “Brent’s Best of the Zoo” post. For those not familiar with Montana slang terms, “Zoo” is a nickname for Missoula. 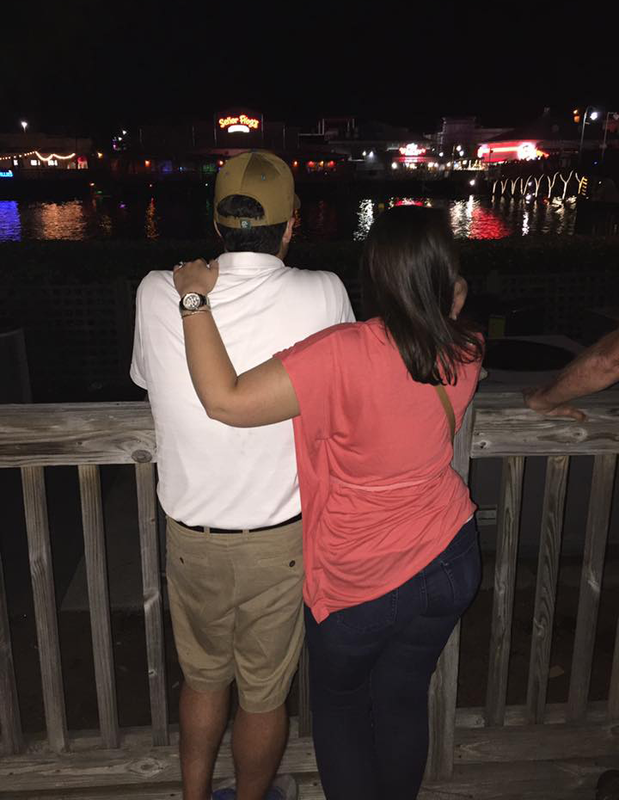 As I have lived in Myrtle Beach for over two years now, I decided to take a stab at naming some of my favorite places and activities in town. In order to keep this blog post from getting out of control, I decided to limit it to 15 categories. Speaking of categories, I tried to choose ones that are relevant to this area and ones that I can actually speak on (i.e. I have never ate sushi before so “Best Sushi in Myrtle Beach” is not a category). So enough with the explanations, let’s get to the winners! Although it is on the Marshwalk in Murrells Inlet, I am counting Drunken Jack’s in Brent’s Best of the Beach. 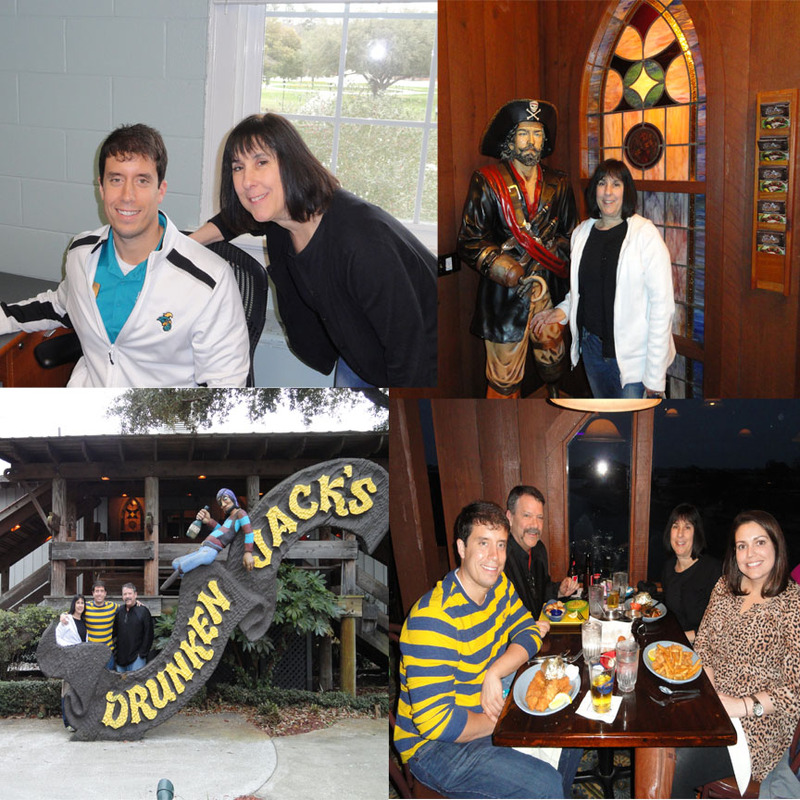 In my option, Drunken Jack’s boasts the best salad bar, the best hush puppies, and the best seafood/steaks in the area. Not only is it the best when it comes to food, it is also tops in atmosphere as well. Built to give the illusion that you are eating on a pirate ship, the place feels cozy. While you wait for your table you can enjoy complimentary popcorn while taking in the beautiful views of the water. If you want the best in scenery, personality, and food, Drunken Jack’s is for you. 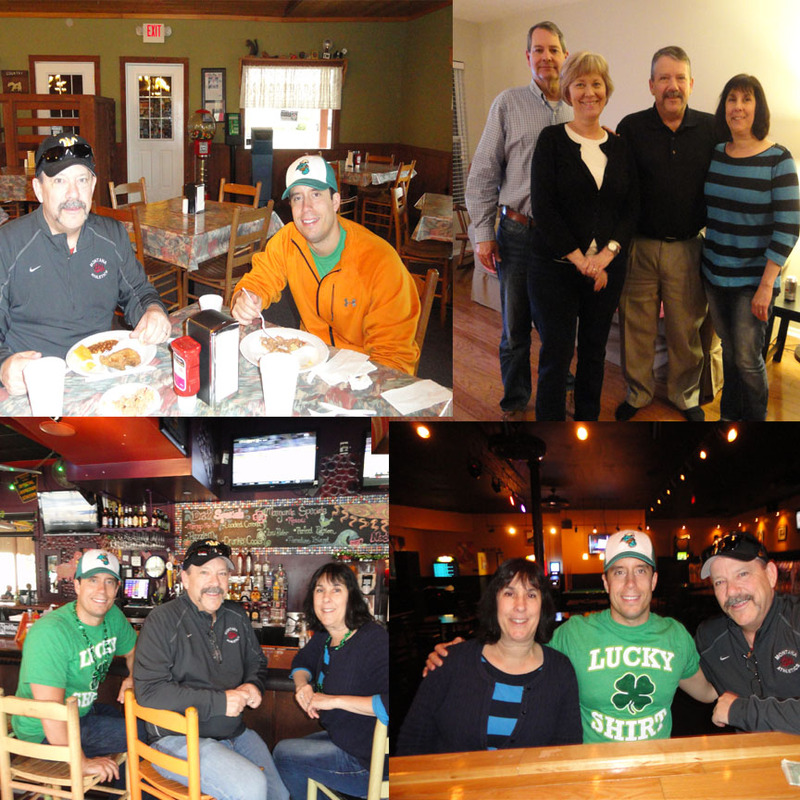 This is a collage of my brother, Sidney, and I enjoying an evening at Drunken Jack’s. I enjoy Remedies not just because it is a locals bar. I count it as my favorite because it is covered in televisions and because it is non-smoking. Throughout the past couple years I have gone to Remedies on numerous occasions to watch my western teams play as their TV package allows them to bring up pretty much any game. The food is excellent and the drink prices are very good. The bartenders are welcoming and treat you well the whole time you are there. This is Sidney and I at in 2014 when we went to Remedies to watch the Montana football team play. Talk about the category with the stiffest competition! 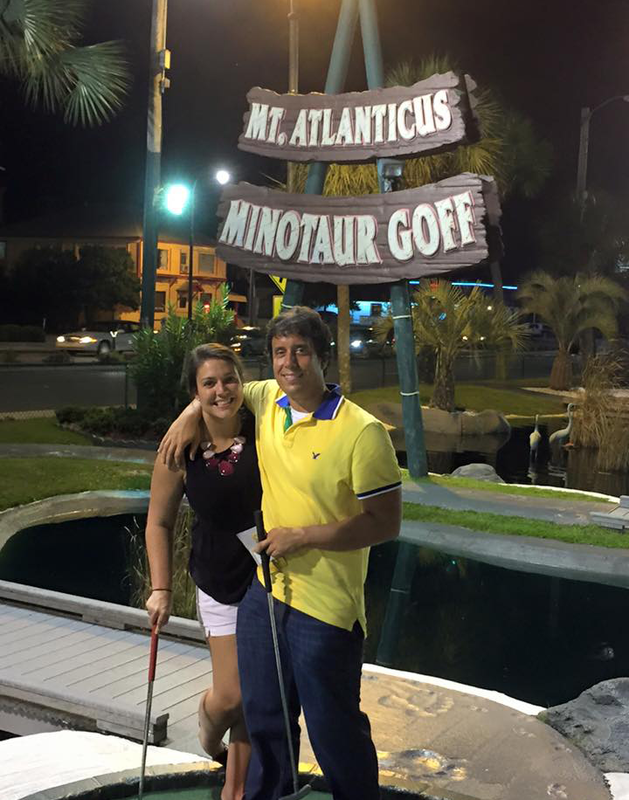 Myrtle Beach is covered with “Happy Gilmore” style putt putt courses. I made the tough decision choosing Mt. Atlanticus as my favorite because of how the course makes you ascend up. The holes are creative, especially the 19th ball return one, but it is the gradual climb of the course I like the most. When you conclude your 18th hole, you are high above in a tiki hut type structure looking over the whole course. Other courses might have dinosaurs, exotic animals, and pirates but Mt. Atlanticus has a view. Sidney and I at Mt. Atlanticus in September of 2015. This is another category with extremely tough competition. Ice cream parlors dot every corner in the Grand Strand area. But my favorite is clear cut. Meyer’s Ice Cream Parlor is an inviting place with the BEST ice cream. The exterior is covered in different colors and ice cream cut outs and the inside takes on a New York Yankees theme but it is the ice cream that stands out. All flavors are fresh and the sundaes are fun and huge. You will feel nostalgia and happiness when you eat inside Meyer’s. I can’t recommend it enough. 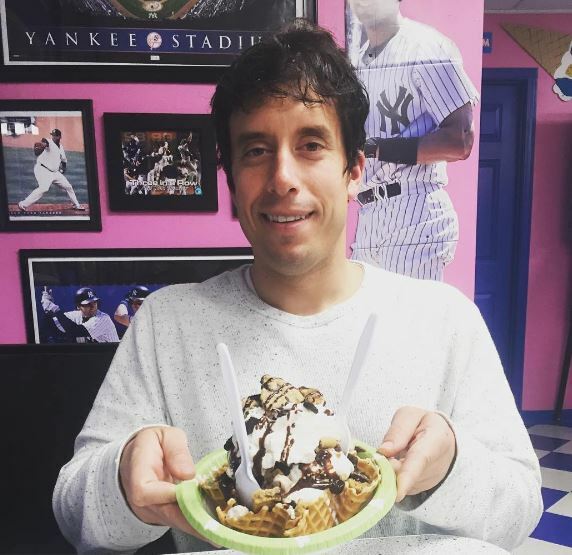 This is me at Meyer’s Ice Cream Parlor (notice the Yankees memorabilia and pink walls in the background) enjoying one of their classic sundaes. In Myrtle Beach you have a hundreds things to do with top entertainment options, the ocean, and numerous golf courses. However, if there is an event that stands out from the Myrtle Beach mainstays, it would be Nights of a Thousand Candles. Every December for a few weeks, the big sculpture garden in Myrtle Beach, Brookgreen Gardens, becomes a Christmas cheer destination. The event will make you forget about the fact that Myrtle Beach doesn’t get snow. Event organizers set up thousands of candles and lights throughout the gardens. You walk on paths and admire the beauty as talented people perform Christmas carols. It is a peaceful and warm way to get into the holiday spirit. 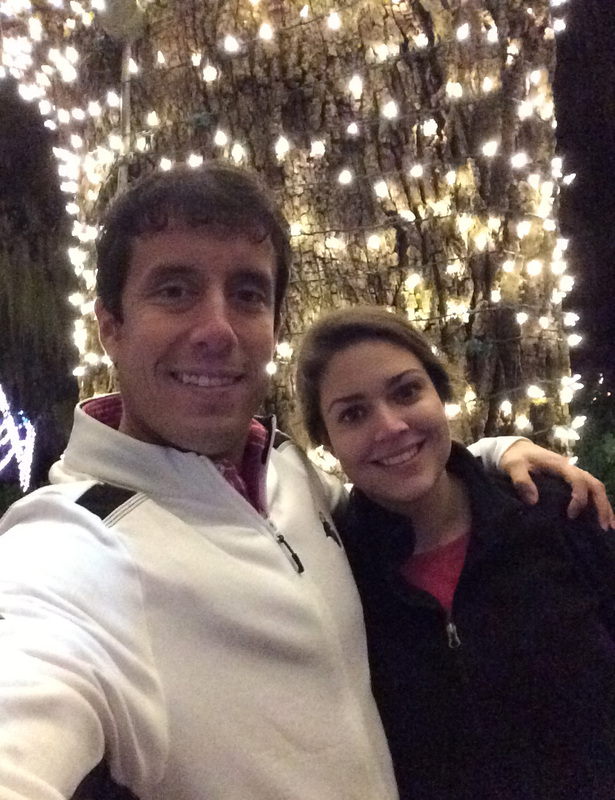 Sidney and I at Night of a Thousand Candles in 2014. A couple months ago I would have given this nod to the Grand 14 at Market Common (Stone Theaters) but the cinema at Coastal Grand Mall is now tops. The theater recently replaced all seats with electronic recliners. Now, each auditorium just has a capacity of 50 people but if you get a seat it is well worth it. The theater is always clean and you can’t beat the location considering it is attached to the best mall in Myrtle Beach. When I was home for the holidays in Spokane I found myself at the casino. I was at a blackjack table sitting next to a woman. She asked me where I lived and I told her Myrtle Beach. She remarked that she visited there for a short time several years back. I asked her what she remembered most. Her response? Mellow Mushroom. Yes, the pizza is that good. I highly recommend it. I like nothing more than enjoying a low key Friday night in with Marco’s Pizza. Much better than the national delivery chains (you will have to pay a little extra), you can count on fresh toppings and plenty of grease. Make sure to order their garlic sauce and you will feel like you made the best choice ever. The hype is real. When Publix came to Myrtle Beach I didn’t know if it would be a game changer for the grocery habits of Sidney and I. But it is. Although we will usually still go to Lowe’s which is just two minutes away from our house, we will frequent Publix if we want an out of the ordinary shopping experience. Where else can you go to get a loaded ice cream cone as a sample? Where else can you go where the baggers still insist on taking your groceries out for you? Where else can you go where the store brand is legitimately better than the premium brand? There isn’t a better supermarket option in Myrtle Beach than Publix. Publix has a terrific line of products. 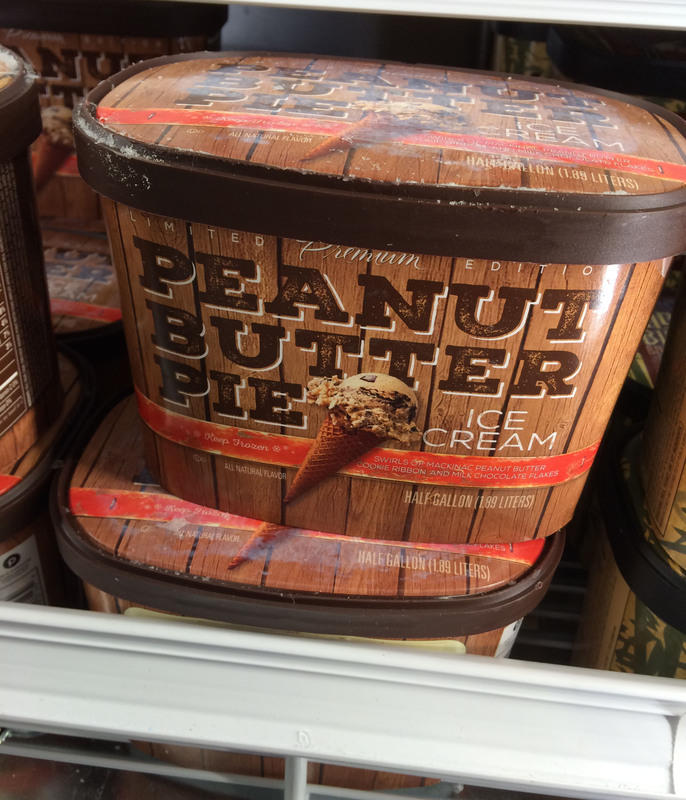 Check out this ice cream flavor. When I tried Which Wich for the first time I immediately fell in love with the concept. You walk in and fill out your order on a brown paper sack. Your sandwich comes out exactly how you wanted it. The food is as perfect as the ordering process. The submarine sandwiches are unique in both build and taste. You will want it again and again. Although Broadway at the Beach is undergoing an evolution of sorts right now, it is still a great place to take visitors. You can enjoy sports bars, frozen drink bars, Mexican bars, live music bars, and clubs. And that is just the adult portion of it. Broadway at the Beach also has numerous restaurants, specialty shops, carnival rides, putt putt, kiosks, surf shops, a movie theater, and more. Did I mention that the place is built around a man made body of water that is stocked with ferocious-looking hungry fish? Broadway at the Beach earns my designation as the “best place to take visitors” because there is something for everyone. Sidney and I enjoying a moment at Broadway at the Beach. As Myrtle Beach is a destination city, it is filled with tourist traps and gimmicky entertainment centers. The Market Common was built as a classy lifestyle center with locals in mind. With several unique restaurants, upscale bars, designer shops, and a nice movie theater all built on a strategically designed and well landscaped property, a relaxing night out at Market Common is easy to enjoy for any couple. I can’t count all the dates Sidney and I have enjoyed out at the area. The Springmaid Pier is away from all the avenue beaches that bring in hoards of tourists. But don’t think Springmaid is full of locals either. Whenever we go, the beach is never full but it is always very well maintained. With plenty of free parking available, it is the most convenient place to go to take full advantage of the beautiful beach. Don’t pass it up. Go up and down Kings Highway in Myrtle Beach and you will see probably around 30 different pancake houses. Many of them taste the same but Johnny D’s Waffles is in a league of its own. From their red velvet waffle to their cinnastax pancakes to their filling skillets, nothing matches Johnny D’s in terms of unique variety and freshness. The restaurant isn’t huge and there is usually a wait but it is definitely worth it. So there you have Brent’s Best of the Beach. Perhaps next year or in a couple years I will do a second version with other categories included. If you aren’t one of my Myrtle Beach readers, I apologize for boring you. If you are a Myrtle Beach reader, please let me know what you think of my list. Have a great week, everyone! Don’t Blink. After a wonderful four full days, my parents flew back to Spokane today. I can’t express enough how nice it was to have them visit me here in Myrtle Beach. I was able to show them my life down South and let them know that I am doing just fine. – I met my parents at the airport as they landed in Myrtle Beach at 10:15 p.m.
– We went to my apartment as my mom got to see where I live for the first time. My parents shook off a long day of flying by eating chips and queso while my dad also sipped on some Sweetwater I.P.A.s that I bought for him. 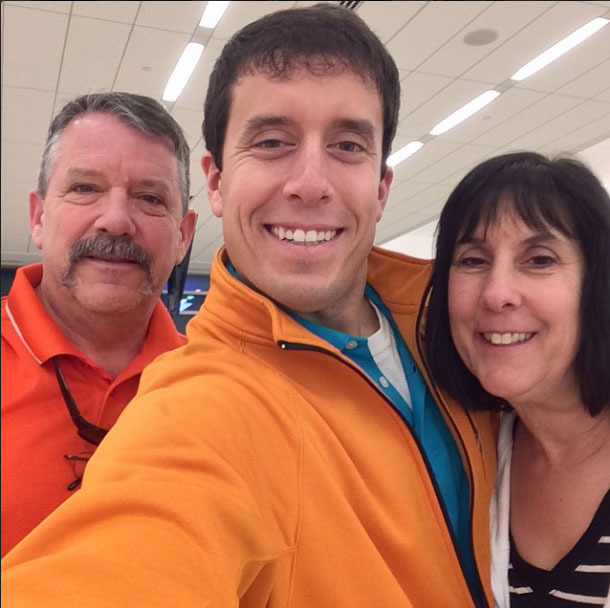 So happy with my parents in the airport. – I worked in the morning and my parents came to my office (they had a rental car) and met my superiors and co-workers. It was great fun taking them to meet roughly 12 people who I work with on a daily basis. – After meeting the University Communication staff, I took them on a tour of campus. It was Spring Break so the students were gone but minus human activity they thought Coastal was a very beautiful place. – I took them to lunch at Waffle House during the noon hour. This was their first time experiencing the magic of this restaurant. They both agreed that the waffle was the best item on the menu. – From Waffle House we went to Sidney’s school, Palmetto Bays. They were able to watch part of an assembly and see Sidney’s second grade classroom. – We went home to my apartment and hung out a little. We then went to one of my favorite neighborhood bars (Remedies) for a couple drinks. – The three of us plus Sidney then went out to the Marsh Walk at Murrells Inlet. We ate at Drunken Jacks as we enjoyed a fabulous meal. My dad had scallops and my mom had flounder. The hush puppies impressed them a great deal. – We rented a Redbox and came home. However, we decided to talk instead and never put the movie in the DVD player. It was a good first full day in Myrtle Beach. – It poured down rain this whole day so we kept to mostly indoor activities. – I took them to the Coastal Grand Mall. My mom commented on how nice she thought it was. – We went to Costco and Wal-Mart to pick up some items. We wanted to do all of our shopping on this day since it was rainy. – We ate lunch at a true BBQ joint called Big D’s. It was a buffet with fried chicken, mac and cheese, pulled pork, cornbread, BBQ chicken, and more. Although it was a cool experience, my parents didn’t care for the food much. – We went to Market Common, a really cool lifestyle center next to where I live. They had a St. Patrick’s Day celebration but most of it was washed out by the time we arrived. We did go to a trendy little restaurant/bar called Nacho Hippo and had a drink. – We went from trendy bar to dive bar. I took my parents to my other favorite neighborhood bar, Klocker’s. – After a brief trip back to my apartment we went to mass. I took my parents to my parish, St. Andrew, for the 6:15 p.m. Saturday vigil. It was a nice service. – From mass we went over to Sidney’s house for a Southern meal of chicken bog. I absolutely love chicken bog and I wanted my parents to experience it. Making this whole evening sweeter was that Sidney’s parents came over to join us. It was so cool to have my parents and Sidney’s parents meet. Sid spent the whole day cooking and cleaning, doing a phenomenal job. It was a special, perfect evening. Despite the wet weather, day 2 was good. Highlight came when we had dinner with Sidney and her parents. – We got up at 7 a.m. and went to the beach and had a very peaceful walk. We then went on the pier and admired the view. This was one of my mom’s favorite parts of the trip. – After the beach we ate breakfast at a place called Paradise Pancake and Omelette House. It was good. – To walk off breakfast, we went to the Myrtle Beach Boardwalk. It just wasn’t my parents first time walking it, I was a rookie as well! We had a nice time strolling along and peeking into shops. 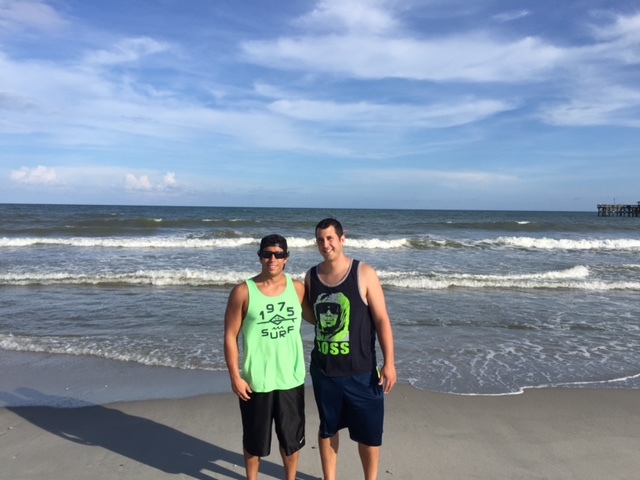 – Next we went to Broadway at the Beach, one of my favorite spots in Myrtle Beach. The area consists of restaurants, shops, and themed bars that surrounds a body of water. My mom bought salt water taffy and we enjoyed a couple drinks at some of the fine establishments. – Later on we went to the Coastal Carolina campus for the Selection Show party. I worked the event while my parents and Sidney sat in the crowd and watched as the men’s basketball team drew Wisconsin. – We went to a restaurant called California Dreaming. We had a very nice meal and great conversation. – The three of us spent the rest of the evening talking at my place. We did a lot on Sunday! – I hustled home after working half the day to find my dad waiting outside for me. We went inside and ate lunch. – The three of us went to Wal-Mart (yep, had to go again) and my parents bought me a couple chairs for my deck. – After sitting in the chairs on the deck, Sidney came over. Us four went to Shipwrecked, a Myrtle Beach putt putt course. I figured my parents needed to experience a round in the miniature golf capital of the world. I ended up winning! – We went to Market Common and had a drink at a brand new hip place called Tupelo Honey. – From there we went to King Street Grille for dinner. It was a very relaxing meal as we really enjoyed ourselves. I had a macaroni and cheese burger while my mom had the biggest piece of fish I had ever seen. – We came home and all watched Jeopardy together. Sidney then went home and my parents stayed up with me until midnight. Look at my mom’s piece of fish! – Sadly I said goodbye to my parents at 5 a.m. this morning. I am so glad my parents got to come visit me in Myrtle Beach. My parents keep amazing me by their generosity and love. It was a special several days, definitely a period of time that we always remember. I love you mom and dad, thanks for everything. Don’t Blink. It was Halloween Weekend but by all accounts it was pretty chill for me. You see, when you don’t have a working phone it makes you pump the brakes a little bit. On Friday afternoon my phone stopped sending/receiving text messages and my capability to make/receive calls was shut down. On the top left hand corner of my device it just says “searching.” Visits to the store of my service provider and an Apple specializing store proved fruitless. Not wanting to put myself in a situation where I would need to make a call/text if I got in an accident or became stranded, I laid low. Even though I wasn’t as active as usual for a typical “Brent Weekend” I did have some fun. 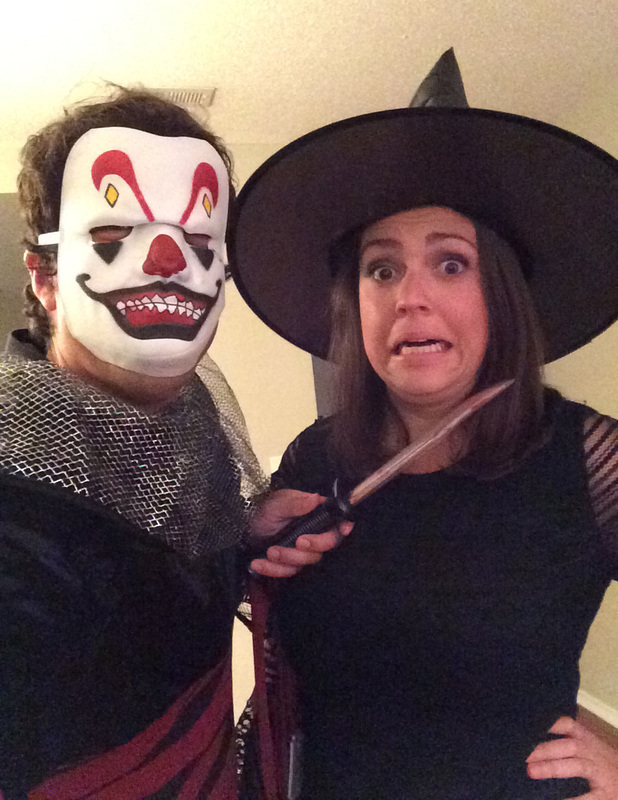 On Friday night I dressed up as an evil clown and Sidney dressed up as a witch. After we ate pizza at Sidney’s place we went to an area in Myrtle Beach called Broadway at the Beach. This popular Grand Strand attraction consists of a big circle of establishments that runs around a manmade body of water. Half of the circle is totally devoted to theme bars and clubs. For Halloween, this area is the place to be. We had a good time celebrating the holiday and seeing the outrageous costumes that others were wearing. Before we hit Broadway at the Beach we posed for a photo. I was an evil clown and Sidney was a witch. Saturday was spent just watching football. I walked down to my local neighborhood sports bar and watched some great FCS football. 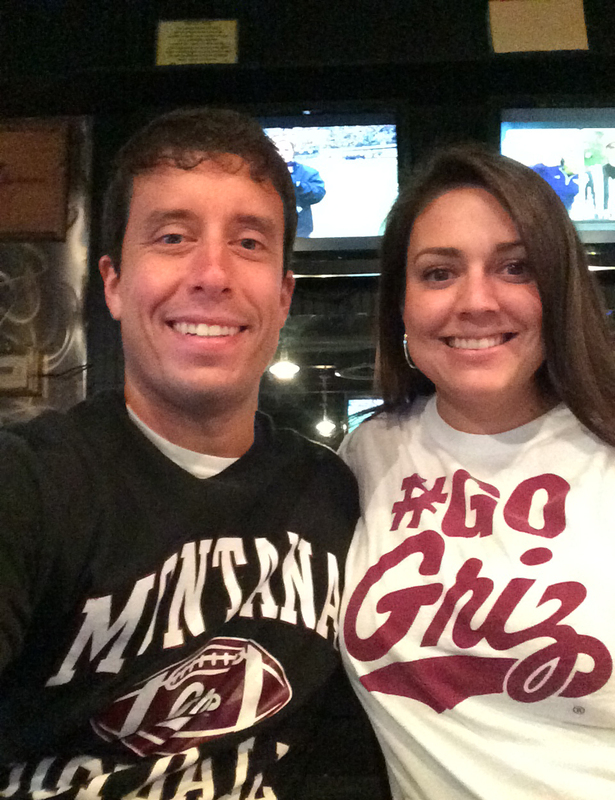 First I watched the Montana Grizzlies crush Sacramento State, 31-13. It was the first time I watched a game inside Washington-Grizzly Stadium from a television after working so many of them from up in the press box. I then watched Coastal Carolina improve to 9-0 with an easy 38-14 victory over Gardner-Webb. In my opinion, Coastal just needs one more win to clinch a bye in the FCS playoffs. Today I went to 7:30 a.m. mass at St. Andrew. Sidney and I then went out to breakfast. In Myrtle Beach they have pancake houses that line the streets, much in the same way that espresso stands do back home. Because of my love of pancakes, I had wanted to hit one up for a long time. We chose a restaurant called Plantation Pancake House. I ordered chocolate chip pancakes and they were great! It also came with eggs and sausage and I had a hot chocolate to wash it down. Every now and then I feel it is important to treat yourself to a nice breakfast. Had a very nice breakfast today at Plantation Pancake House. You bet I got whipped cream added onto my pancakes. A couple hours later we went to a Sunday matinee movie. For just $5 each, we got tickets to watch Jake Gyllenhaal’s new movie, “Nightcrawler.” While some might find it a little creepy/dark, it was a movie right down my alley. Gyllenhaal plays the role of an awkward unemployed guy who turns to a rather slimy profession. He invests in a video camera and a police scanner and he starts going to crime/accident scenes where he shoots footage and then sells it to a local news station. The film illustrated what local news stations will do to break news first and the shady type of work that people engage in to fuel the ratings quest of news organizations. 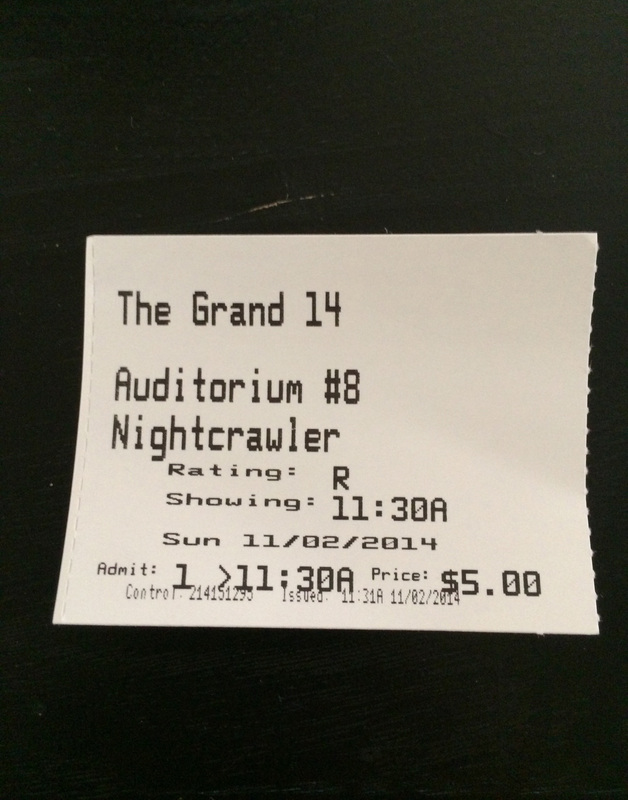 My movie ticket for “Nightcrawler.” Can’t beat the price! Hope everyone had a great Halloween. For the time being, if you need to get a hold of me, please reach out via social media. Have a wonderful week! Don’t Blink.